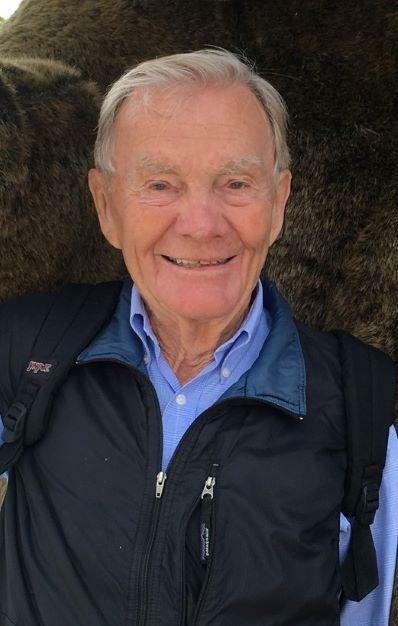 Bob Maxwell passed away February 3, 2019 in Helena, Montana. Bob was born in Roundup, Montana May 23rd, 1928, to Paul and Joy Maxwell, the youngest of four children. They lived on the homestead in Roundup until Bob was 10, when they moved to Fairfield, Montana. As a farm boy, he was able to build or fix almost anything, and he was not one to sit around. He woke early and was always puttering on some project. In 1956 he married Ardis Brown. Ardis had a daughter from her first marriage, Jo Ann, and together, Bob and Ardis had two more daughters: Betty and Brenda. Bob was a self-starter who had more than one side business most of his life. After working at the air force base in Great Falls painting planes, he became a piano salesman. From there he worked at Self Service Furniture in Billings and eventually became a traveling salesman for several furniture manufacturers. The nomad life of traveling his vast territory suited his personality. He loved people and would find something to talk about with anyone he met. He became friends with all his customers and the owners of the hotels he stayed at. He could tell you where the best cinnamon rolls could be found in any of the 4 states he traveled! In addition to these jobs, he also owned a store called The Fun Shop in Billings. Bob belonged to a magic club and he sold magic tricks and costumes at this little store. He and his dad built the games for carnivals and ran them for the schools and churches that needed fundraisers. He built concession stand trailers and travelled with the family (and neighbor kids/nephews) to the various Montana Indian pow-wows and gatherings, selling snow cones, popcorn, hotdogs and cotton candy. Bob was always a kid at heart: often he would play with the toys he bought his grandsons before wrapping them up and he loved dressing up in his Santa suit for the neighbor kids. In 1974 Bob had the opportunity to expand his furniture territory to Idaho and Eastern Washington and the family moved from Billings to Coeur d’Alene Idaho. He was too busy to continue with his concession stand and finally had to settle for just one job! In 1992 Brenda became his furniture representative partner and together they managed his territory until 2000, when he retired. Coeur d’Alene meant new fishing holes and lake fishing instead of streams, so he soon bought a little used boat. Whenever he could find a couple hours on a sunny afternoon, he would take everyone out fishing or water skiing. Bob and Ardis eventually bought a cabin at Cave Bay on Lake Coeur d’Alene, where they could fish all summer. Ardis passed way in the fall of 1993. Bob and Marilyn Hudson knew each other professionally for many years before becoming a couple. They enjoyed 23 fun-filled loving years together, 16 of those years wintering in their Arizona home on the golf course. Their world travels took them to Indonesia, Italy, France, Spain, a river cruise on the Danube and a month-long tour of South America. Bob was preceded in death by his parents, his brother Charles Reuben Maxwell, his sisters Betty Maxwell and Clara Dell Autry, his niece Debbie, his grandson Tim Daem and his wife Ardis. He is survived by his longtime companion Marilyn Hudson, his daughters Jo Ann Frieschlag, Betty Bisom (Paul), Brenda Maxwell-Bumann (Robert), his grandchildren Justin Friedly (Kristen), Jarret Friedly (Danielle), Greg Daem (Alison), Stephen Daem, Shayla Daschele (Ryan), James Bisom (Nicole), Alyssa Schenk (Beau), and Alexandra Maxwell-Bumann, 7 great-grandchildren, and many beloved nieces and nephews. A Memorial Service will be held at 1:00 p.m. on Thursday, February 7th at Touchmark, 915 Saddle Dr. in Helena. Cremation has taken place and burial will be in Coeur d’Alene at a later date. Memorials in honor of Bob are suggested to Timothy Maxwell Daem Endowment, c/o St. Peter’s Health Foundation, 2475 Broadway, Helena, MT 59601. Please visit below to offer the family a condolence or to share a memory of Bob. Marilyn, Betty and Family. I was saddened to learn of Bob’s passing. He was such a kind soul. I am so glad I had the opportunity to meet and visit with him over my many years with the Foundation. I was very blessed to have the opportunity to know Bob as a Father-in-Law and as a friend. He was always the perfect gentleman, always wanting to make sure everyone was included and felt welcome. I have many fond memories of dinners on the deck and time on the boat. His sense of humor and love of life will always be remembered. I never got to know the fisherman legend I had heard about but did have 1 day on the water in Coeur d’Alene and can only imagine! RIP Bob, you deserve the rest. Marilyn and family, I was deeply saddened to hear of of Bob’s passing. I met Bob while I worked at Touchmark. He was the sweetest gentleman. I was will miss him greatly.